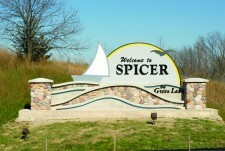 Spicer is a delightful community located on the shores of Green Lake, in the heart of the Little Crow Lakes Region, 99 miles west of Minneapolis/St. Paul. With its friendly people and restful atmosphere you will want to choose from a lakeside resort, bed & breakfast, hotel or campground and stay awhile. No matter the season, if you’re looking for family fun you can’t beat Spicer and the Little Crow Lakes Region, where hospitality always comes first. Cross-country skiing and snowmobiling are popular sports for residents and visitors alike, Spring with its freshness and promise is always a good time to visit. Shopping is always great with many gift, antique and specialty stores. In the summer you’ll find weekend flea markets and plenty of farmers markets along the road. Drop a line in one of our sparkling clean lakes or enjoy a variety of water sports. Fall brings spectacular colors as our forest and prairies are transformed into brilliant seas of orange, gold and red. Come stay with us in Spicer.